Hello Friends! I'm popping in today with another card I created with the August 2014 Simon Says Stamp Card Kit. 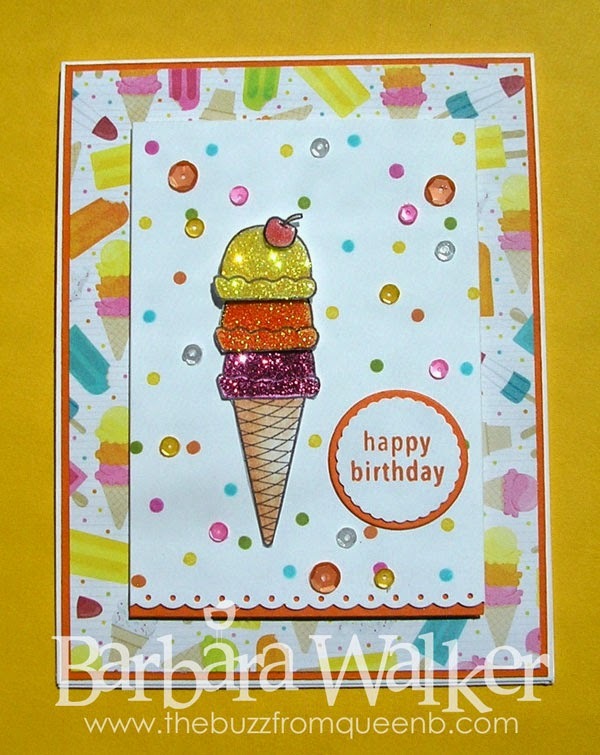 When I first saw this ice cream stamp, I knew I wanted to glitter it up. I stamped the images and then colored them with a combination of Spectrum Noir and Prisma colored pencils. I blended the colors out using gamesol and a blending stump. Then, I fussy cut all of the pieces and added glitter. While those were drying, I worked on my focal background. I loved the little dots in the patterned paper, so I decided to replicate them on the focal. I used the single dot stamp from SSS Sending Happy Thoughts stamp set, which was included in last month's card kit. Next, I punched the border, then added a strip of orange behind it. I stamped the greeting, punched it out and matted it onto a circle that I die cut with Circle Nestabilities. 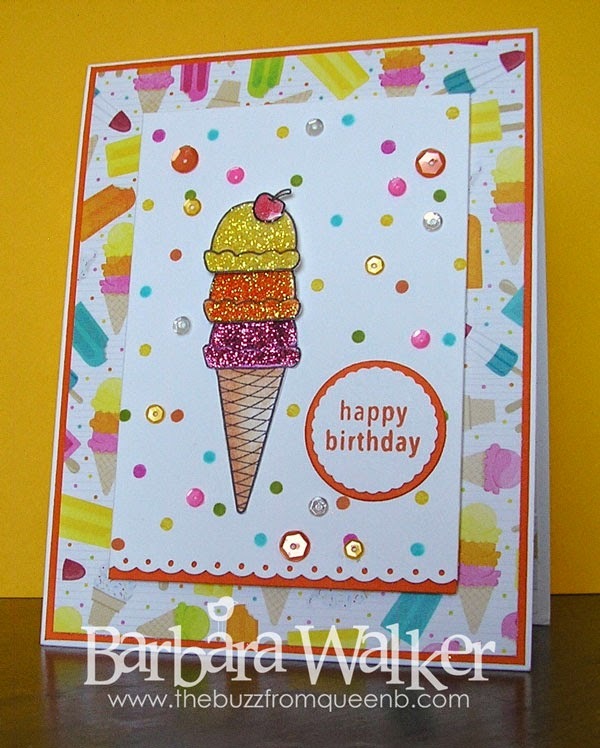 I adhered the ice cream and the greeting onto the focal and then added lots of Pretty Pink Posh sequins. And to finish it off, I added the little cherry that I colored and coated with Glossy Accents. And that was it! Thanks for visiting today! I hope you are staying cool in your neck of the woods. Yesterday we hit 112 degrees here. I was NOT a happy camper! stamps, card stock and patterned paper from the August 2014 Simon Says Stamp Kit. A gorgeous card Barbara, I love your design and a great use of papers. Your sparkling ice cream cone is 'delicious' and fabulous elements!! Hello Barb long time no see - such a beautiful card - love the sparkles - great job as always!! !